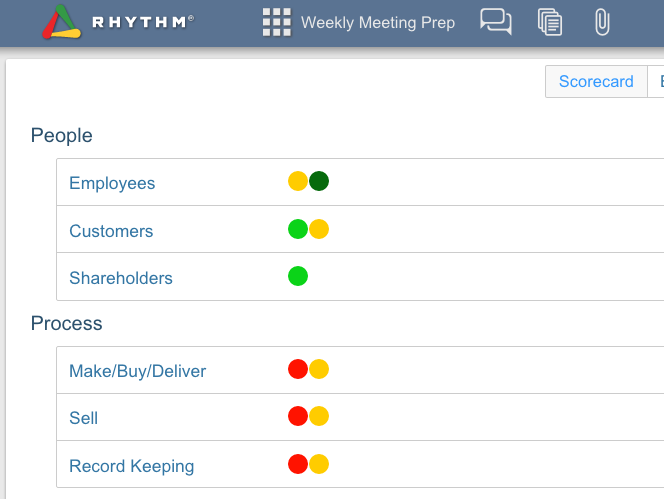 Rhythm software helps mid-market companies create and view the right KPIs with dashboards. 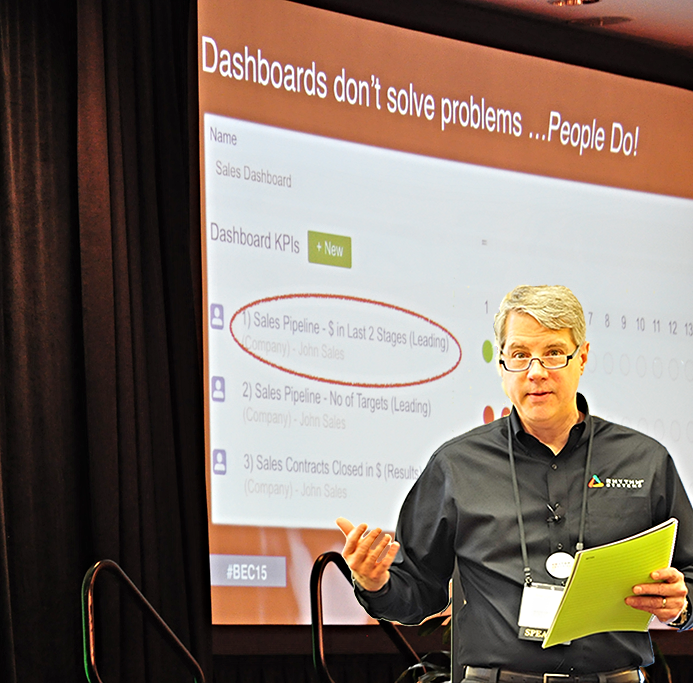 Are your KPIs driving desired business results? 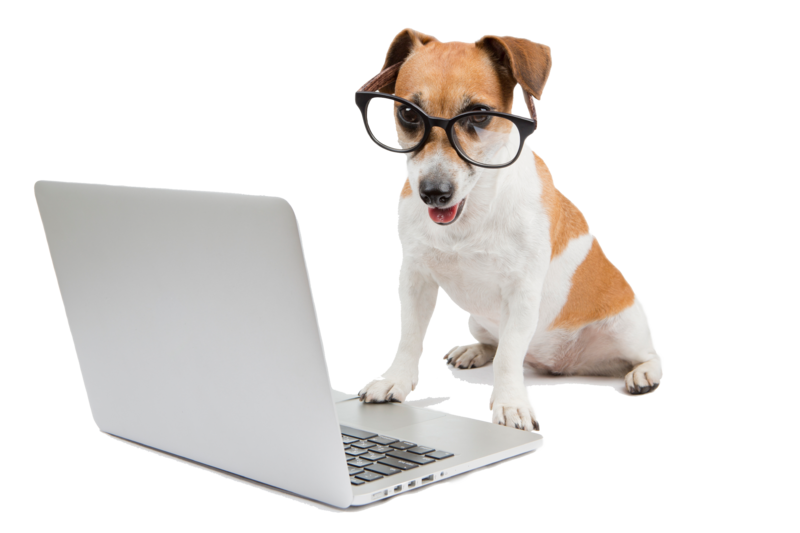 Team members enter data and Rhythm populates the views for the company. 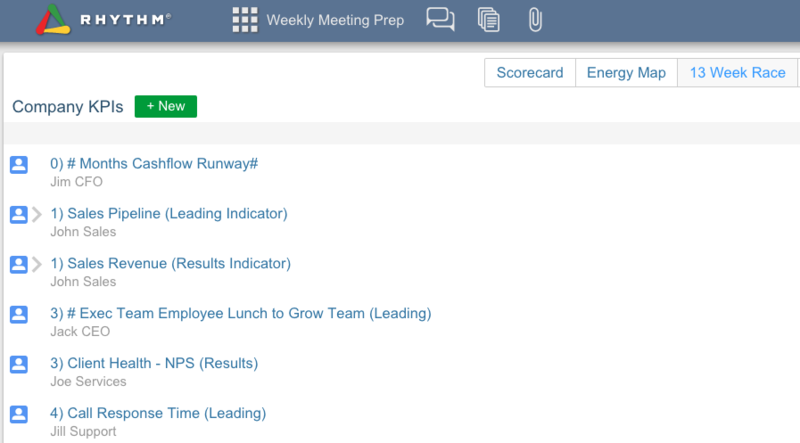 Enter the KPIs in our dashboard reporting software that you want to know and measure - this will help team members achieve results faster. There are 4 ways to view your KPIs in Rhythm. You can choose one of these views or a combination of them to use in your Weekly Adjustment Meetings when you discuss KPIs. Executive team can review your scorecards to get a company overview in seconds. See the energy of the team working to impact your KPI to drive execution on that metric. 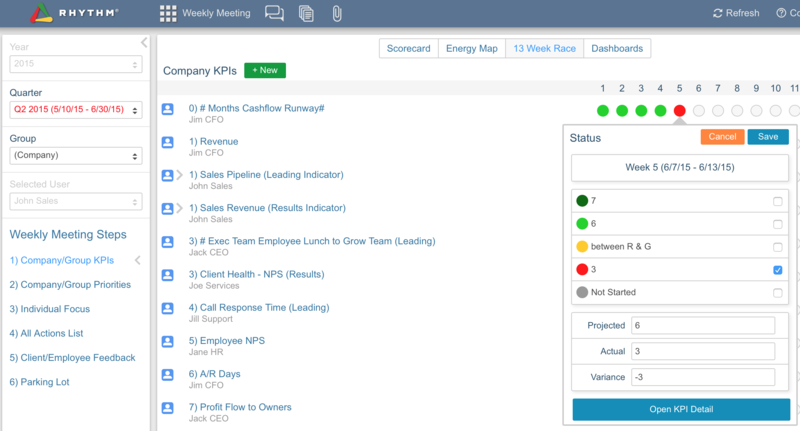 The Energy Map View is the easiest way to record, prioritize, assign an owner, state what the success criteria will look like and to categorize your KPIs so they show up on the Scorecard view. 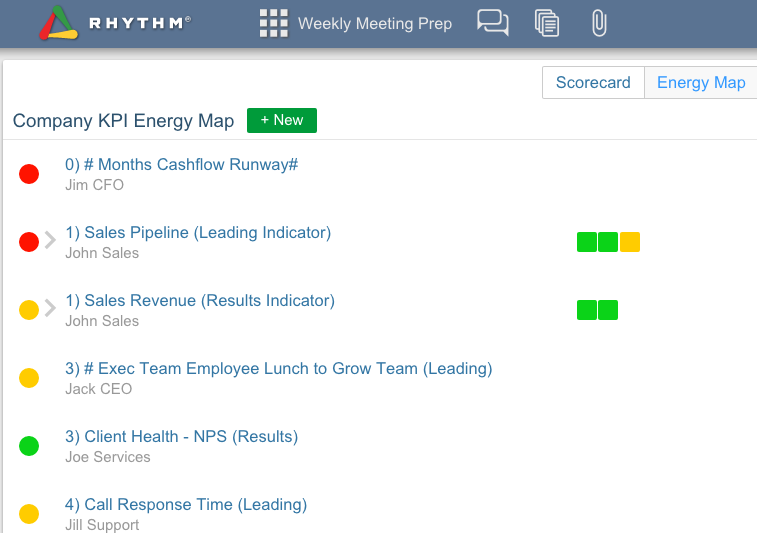 Review your Energy Map - each square represents a priority, you can see when energy is actually moving results on a specific KPI. 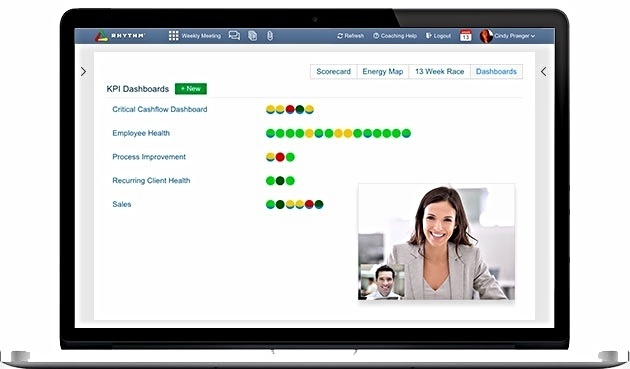 The Energy Map view lists your Group's KPIs, either according to how you've ranked them or alphabetically. 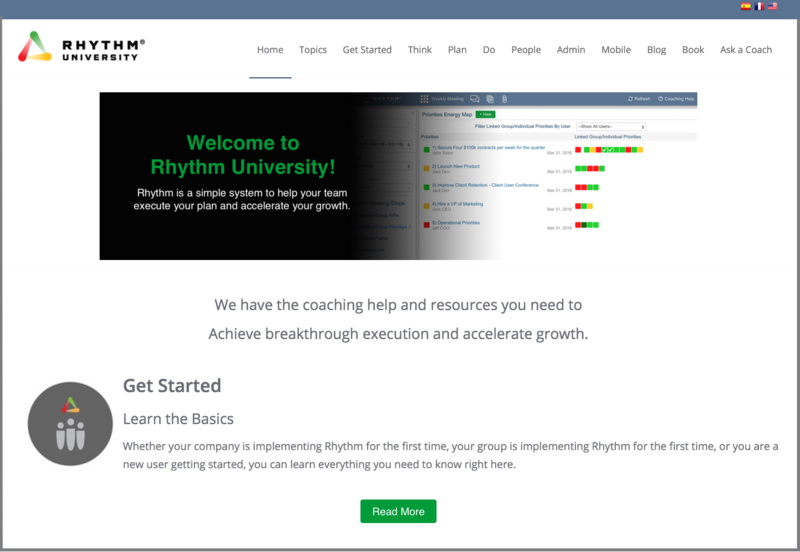 Rhythm software shows you where adjustments need to be made. See how you are doing over the weeks in the quarter. Focus on adjusting reds and yellows to get back on track. 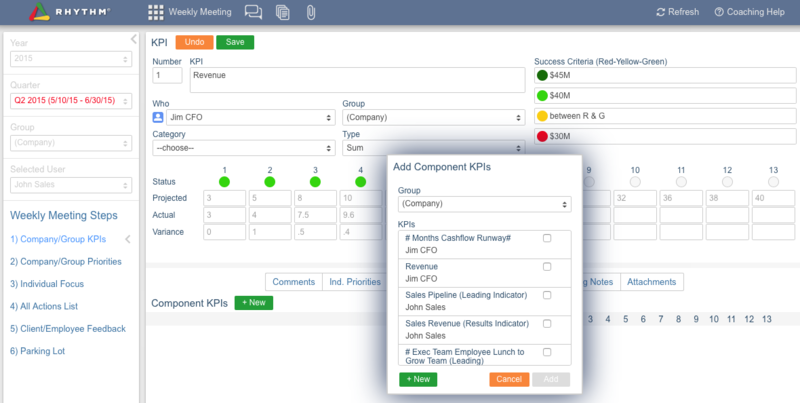 Organize your KPIs into groups. Setup KPIs for specific business questions or problems you want to work on or solve. View them to make sure your leading and results indicators are on track. Clarify the purpose, desired results, skills & competencies and key responsibilities for each role. The leader, employee and the team complete this together so that there is a mutual understanding of the purpose, responsibilities, measurements and skills needed to be successful in any given position. Composite KPIs give you more information without individual work. Group Component KPIs into Composite KPIs in order to sum or average the Projected, Actual, and variance data each week of each quarter. Schedule a demo to learn how Rhythm can help you develop, record, review and adjust KPIs in one cloud-based platform.